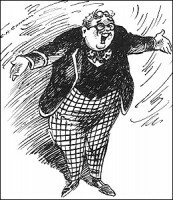 Billy Bunter – larger than life ! I say you fellows do listen to a chap for a minute … So began many a tale of a hero of mine good old William George Bunter of Greyfriars School. 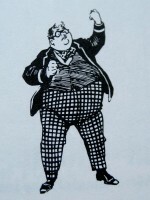 I stumbled upon Billy Bunter quite by chance when I accompanied my mother to the local library one balmy summers evening many, many years ago, when summers were summers and winters were winters and I was still in short trousers (only the other day then I hear some wag remark !). Actually I would have been about nine or ten years old, in those days you didn’t wear long trousers until you went to senior school and then only in the second form. As there were no ‘Just William’ books on the library shelves my eye was caught by the title ‘Billy Bunter of Greyfriars School‘ and as it happens having read that one book I just couldn’t wait to get back the following fortnight for yet another dose of Billy (sounds painful, can you get anything for it ? ). Billy Bunter or William George Bunter to give him his full name was the invention of Charles Hamilton and written under his pen name of Frank Richards. The schoolboy character originally featured in stories set at Greyfriars School in the boys weekly story paper ‘The Magnet’. First published in 1908 The Magnet was to continue through to 1940 with Bunter appearing in almost all the publications with Frank Richards writing the majority, but not all of the stories, although his pen name was applied to them all. Sadly the Second World War saw an end to The Magnet due to paper shortages. 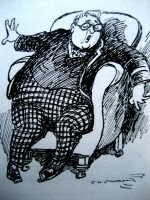 Billy Bunter may have disappeared forever had it not been for publisher Charles Skilton who commissioned Charles Hamilton to write a series of books around Bunters adventures and those of the ‘Famous Five’ (no not the Enid Blyton ones these were the original ones, Wharton, Cherry, Bull, Newton and Hurree Jamset Ram Singh or Inky to his friends) at a fictitious private school in Kent …… Greyfriars. 38 hardback books were written in total and although all were produced with various coloured boards one thing remained constant, they all came with the distinctive yellow background dust jacket. Initially published by Skilton and then later by Cassells the first novel, ‘Billy Bunter of Greyfriars School’ saw light of day in 1947 and began a series which continued for the rest of Hamiltons life and certainly gave me enjoyment throughout mine. I will limit this post from the perspective of those 38 novels as the subject of Hamilton, Bunter, Greyfriars et all is just too large as to do otherwise but is a subject I will no doubt return to. But what is it that endears one to the Billy Bunter stories ? Certainly Bunter is a most unlikely hero, addressed by his form master Mr. Quelch in one episode Bunter is told, ‘You are lazy, idle, greedy, undutiful, slack in class and slack at games – in no respect whatever a credit to this school.’ He goes even further, ‘Your stupidity I can excuse – I can make allowance for that. But your idleness – your slackness – your incorrigible untruthfulness – these are faults you could amend, if you chose. You are a disgrace to your form, Bunter’. Bunters response as always just makes you smile or indeed laugh out loud, ‘Not me Sir ! perhapse you are mixing me up with some other fellow sir, perhaps your thinking of Wharton or Cherry … -or-or Nugent .. -or Toddy !’ … Priceless, for Bunter is unable to see his own faults and anyone who points them out is regarded as a Beast ! particularly his form master Quelch who Bunter insists is prejudice against him. Yet despite all his faults, and in Bunters case they are many, one simply cannot help but feel sympathy for the character Charles Hamilton has created, however turn the page and read on and inevitably you feel like booting him yourself ! Bunter seems to have two main aims in life, one is to avoid work of any description indeed he will often spend twice as long trying to avoid it as doing it in the first place ! Instead he prefers to laze in a comfy armchair in front of a blazing fire eating a chunk of toffee .. for that is Bunters other concern .. food. By any standards Bunter is big, no lets be honest Bunter is fat, and his thoughts are almost always centred on feeding the inner Bunter. Bunters greediness knows no bounds, sticky buns and cake he can demolish at a sitting but its perhaps jam that has the ability to draw him like a magnet. Despite never having any money himself, although he is always expecting his infamous Postal Order to arrive, Bunter is a master scrounger up and down the Remove of anything from the odd copper or two to a sixpenny piece and in some exceptional cases the odd half-a-crown, anything with which to buy some sticky sweetmeats from the tuck shop and if all else fails he is quite capable of helping himself to comestables from other boys study cupboards ! all without a though for the rightful owner, inevitably Bunter is found out whereupon its whops from Quelch – Swipe ! .. ‘Yarooooh’, Swipe ! .. ‘Oh ! Ooooh !’, Swipe, Swipe, SWIPE ! .. ‘ Yow – Ow – WHOOOOOOOP !’ or a booting from his fellow Removites – ‘I- I say, you fellows, Yow-wow, Beasts, Oh-lor’ !’ neither of which has any effect on him except in the short term. Bunter has the ability to wander from the truth without knowing that he has, he can repeat the tale that often that in the end he believes that his untruth is in fact a reality. In his opinion Bunter is ‘the goods’, the only decent fellow at Greyfriars and all the others are Beasts ! that is until he needs their help in one of his outrageous schemes which are usually greeted on their inception with Bunter cachinating ‘He-he-he !’. Bunter may be simple but he is cunning, unfortunately for him his schemes always have a habit of coming unstuck but invariably have the habit of turning out all right by the last page. All my pals in the Remove are hearby rekwested to ralley rownd and help a chap out of a hoal. THE WEAK’S GOOD KAUSE ! Every fellow willing to help a pal in a bad phix, please stepp into No.7 Studdy, and put something in the bocks on the table. Smorl contribootions thankfully receeved. Shell out your bobbs and tanners and half-crowns. P.S. Kurrency noats will be welcome. Bunter was rather pleased with that ‘notiss’….. Needless to say Quelch wasn’t ! However beneath all this selfish exterior, when push comes to shove, Bunter does try his best to do the right thing, usually with hilarious results for all concerned. The one person Bunter does care for, apart from himself that is, is his mater, so when all is said and done the chap can’t be all that bad ! … CAN HE ? 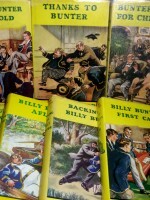 If you are looking for any of the Billy Bunter series of books or any of the Billy Bunters Own series or indeed anything Billy Bunter related please let me know and I will see if we have it in stock. 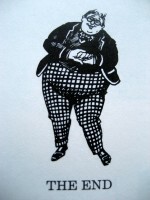 I am looking for Billy Bunter’s Beanfeast, 1st edition – 1952 published by Cassell. It must be in very good condition, with dustjacket. Hi there Debs, Oh Lor .. a 1st. Ed. BB Beanfeast is something I don’t have at present. As you will see scattered through these pages we have recently relocated upto North Yorkshire and I sold most of my Bunter 1st editions at that time .. still have some left but sorry to say not this title. Will see if I can locate one and get back to you if successful. Hi, ALSO a closet Bunter fan! Have failed to find any type of Bunter memorabilia, eg a figurine, toy, model, whatever. Do you have anything? Best wishes from New Zealand. Hello there Niall or should that be ‘I say Niall old chap’, Bunter memorabilia ? You’re right it is very hard to come by and what I have seen marked as such to me never was anything to do with the ‘Fat Owl of the Remove’ ! One reason I think for this lack of ‘BUNTERABILIA’ was that at the time I first came across W.G. he didn’t have what you would call a terrific fan base. His popularity certainly expanded directly in proportion to his waist-line with his excellent portrayal by Gerald Campion in the BBC TV series, but still no spin-offs resulted. There again let’s face it he wasn’t what you would class as a role model ! unlike such schoolboy heroes such as Dan Dare and the like. Hence no wrist or pocket watches were made featuring W.G. ( perhaps with a moving arm clutching a cream bun ? ), no cups or plates adorned with his rotund figure, not even a lapel badge and sadly no plastic figures of him and the ‘famous five’ to be found tucked away inside a packet of corn flakes ! So the short answer to your question Niall is no I don’t have anything Bunter related apart from the usual books / Magnet issues and CD’s etc and to be honest in all my years I’ve not come across anything else Bunter related … but if anyone knows anything that was classed as Bunter merchandise please let us know and we can all keep a look out for it ! I have been a ‘fan’ of the Bunter books (and indeed everything else by Charles Hamilton) for a long time. I have all the post-war Bunter in 1st editions. If you come across these titles and they have to be in good condition, please contact me. Hi Naveed, the sorrowfullness is extremely terrific, as a mutual friend of ours might say, but I don’t have those particular titles at the moment. However if I come across them I will certainly be in touch. By the way I’m thinking of doing another post – when I can get round to it – detailing some of the errors between the written Bunter text and the related illustrations. Interesting or not ? What do you think ! Thanks for looking out for my three (wanted) Bunter (Hawk book) titles. Yes I think that your idea of doing a post which details any errors between the written Bunter text and the related illustrations would be spiffing. I look forward to it. On the whole the artists (Macdonald and then Chapman) for the post-war Bunter books were pretty accurate, but they did make mistakes sometimes! Perhaps not reading the text too closely. I look forward to your thoughts. sorry I forgot to mention that my very favourite artist for drawing Bunter and indeed anything to do with Greyfriars and associated characters/places (even when the chums went to foreign countries on travel) was….Leonard Shields who drew in the Magnet story-paper. I think he was a great artist, though alas I only own one Bunter related drawing by him from the Magnet! ( I do have several other illustrations by him from other story-papers). In my opinion far better than any other illustrators who drew the Frank Richards stories. Shields got along very well with CH Chapman who drew the post-war Bunter books (after RJ Macdonalds passing). Naveed, will certainly make this a priority but don’t hold your breath as I seem to have less and less time these days but will perhaps start with a couple of plates and add to them as and when. As you rightly say Shields was a superb illustrator, some of his best work appearing along with Chapman in the ‘blue and orange’ Magnet issues. As it happens I’ve just picked up a couple of dozen issues at auction so I’m looking forward to thumbing through these over the coming days. One thing that always amazes me is that the illustrations were not signed or even initialled by the artist and if they had been it would have made life so much easier. Hi, Could you email me please with the Billy Bunter books you have in stock and the prices? I’m interested only in the ones published pre 1970 and not necessarily 1st editions. Attempted to e-mail you with a list of books I currently have but comes back as undeliverable to the address you left ? No idea Brian, but if anyone is interested in these books then feel free to message myself and I will be more than happy to put you in touch with Brian for you to sort out between yourselves.